Come and enjoy a cup of tea with us! 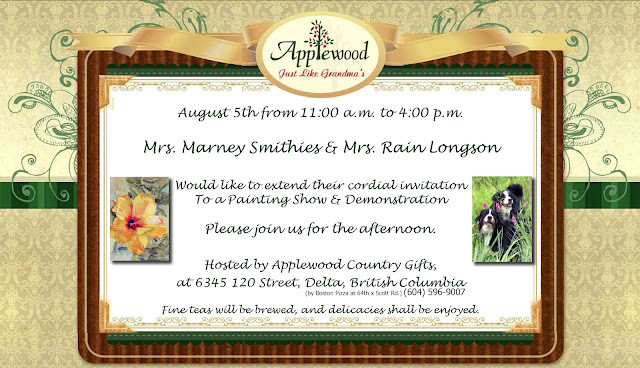 We will be selling our original paintings as well as demonstrating acrylic and water color painting. ART-ON-GOOGLE - A MEETING POINT FOR ARTISTS. IT'S FREE AND ALWAYS WILL BE. Rain Longson and I will be there to meet and greet the guests who come by to see our Summer Fun art show, colorful watercolor florals, acrylic paintings, and sketches of family pets. Today I'm excited to announce the official launch of the 3rd site to the Eezy network!Videezy is a community for video editors to download high quality free HD stock video footage quickly and easily. It is also a place to share your free cutaways, b-roll, backgrounds, effects, motion graphics, and any other types of HD clips you would like others to use. I'm sure this will come in handy considering how many millions of videos are out there now and making it easy to share is key. The Arts Council of Surrey has approved your application to be an artist in residence at the Newton Cultural Centre for 2012 -2013. The artists in residence program will run on Tuesdays and Thursdays. Oct 2, 2012 to Nov. 27,2012 and Feb. 5 to May 31,2013The Gallery is open for the Artists in residence program – Tuesdays & Thursdays during this 6 month period. 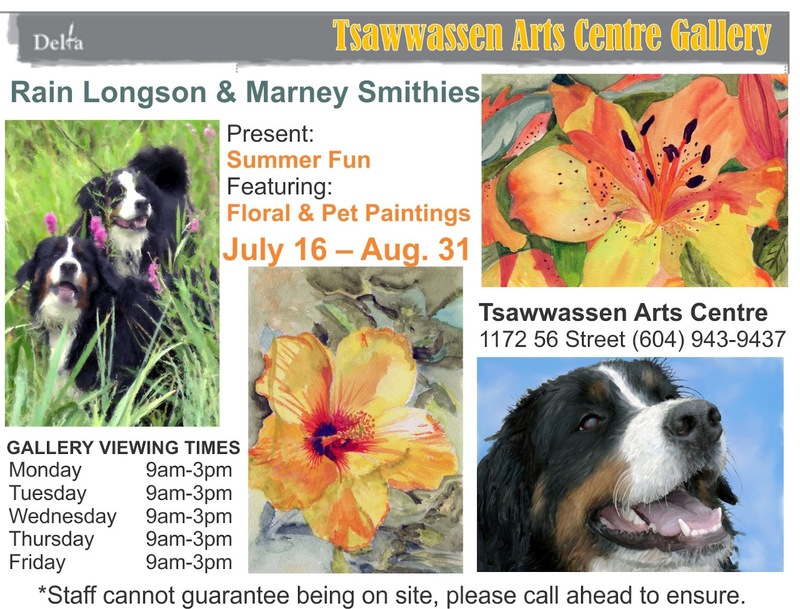 My friend and artist Rain Longson (a incredible realist painter) are having a joint show and sale at the Tsawassen Art Gallery, show runs until August 31st, 2012. Hope you get a chance to check it out, if you have any questions just holler. Sunday Aug. 19th from 2-4pm. Mine are the watercolor florals and Rain's paintings are the acrylic on canvas. I JUST FINISHED POSTING MY LATEST WATERCOLOR PAINTINGS TO MY WEBSITE AND THEY ARE ON FACEBOOK AS WELL, ON THE MARNEYS ART PAGE. THE GALLERY IN THE GARDEN ART SHOW AND SALE TODAY WAS A SUCCESS, THERE WERE APPROX 20 TENTS AND THERE WAS GOOD TURN OUT OF PEOPLE CONSIDERING THE WEATHER WAS WINDY AND NOT HOT, AT LEAST WE DIDN'T GET WET. HAD FUN WITH RAIN, AS ALWAYS AND MEET SOME GREAT ARTISTS. THANKS TO FAMILY AND FRIENDS WHO CAME BY TO CHECK OUT THE DISPLAYS. AS WELL A BIG THANKS TO RAIN AND HER HUSBAND FOR HELPING ME TO SET UP AND TAKE DOWN. Preparing for this weekend event. Gallery in the Garden at the Wellbrook Winery will take place July 15th, 11 am to 4 pm. Gallery in the Garden is an Artisan Marketplace where local talent exhibit and sell all forms of visual arts (clay, stone, wood, acrylic, glass, photography, silk, oil, watercolour, fabric, metal, pen & ink and more.) Fun for the whole family: face painting, blueberry pies, fudge, juice tasting, wine tasting, music, pottery wheel throwing demo, art, art and more art. 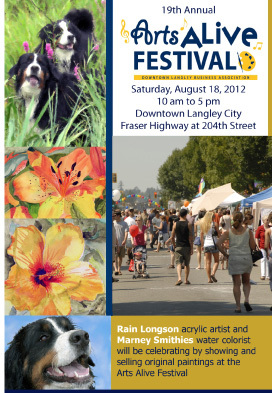 I will be there with a wide selection of my paintings. Stop by for a chat, look see and maybe buy something.